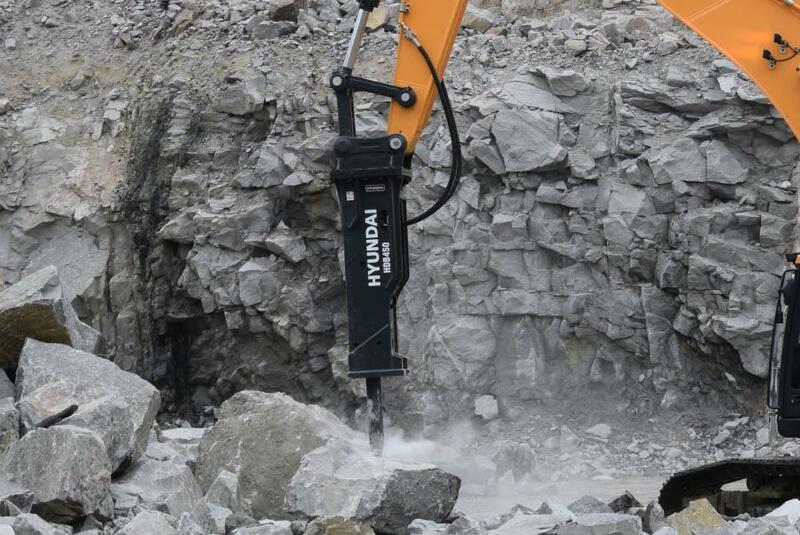 Hyundai breakers have a large chisel diameter, which increases the strength and durability of the chisel. Four chisel options are available. The HDB series of hydraulic breakers from Hyundai Construction Equipment Americas Inc. includes 15 different models to fit multiple machine sizes and applications. Six models, ranging from 253 to 1,354 lb. (115 to 614 kg), are designed for use on Hyundai Series 9A compact excavators. Four models, ranging from 2,048 to 4,773 lb. (929 to 2,165 kg), fit mid-range Hyundai HX series excavators in the 10- to 20-ton class range. Five models, ranging from 6,243 to 12,401 lb. (2,832 to 5,625 kg), are designed to fit large Hyundai HX series excavators up to the 100-ton class. Hyundai breakers have a large chisel diameter, which increases the strength and durability of the chisel. Four chisel options are available. For use on a Hyundai excavator, standard equipped mounting brackets match up perfectly with the Hyundai linkage. When used on other excavator brands, Hyundai dealers can fit custom mounting brackets for any machine. The HDB breakers offer a large diameter tie bolt for high performance and optimum durability. Hoses connecting the inlet/outlet ports use a new adapter type that avoids bolt breakage and oil leakage. An auto-greasing feature protects moving parts from undue wear.